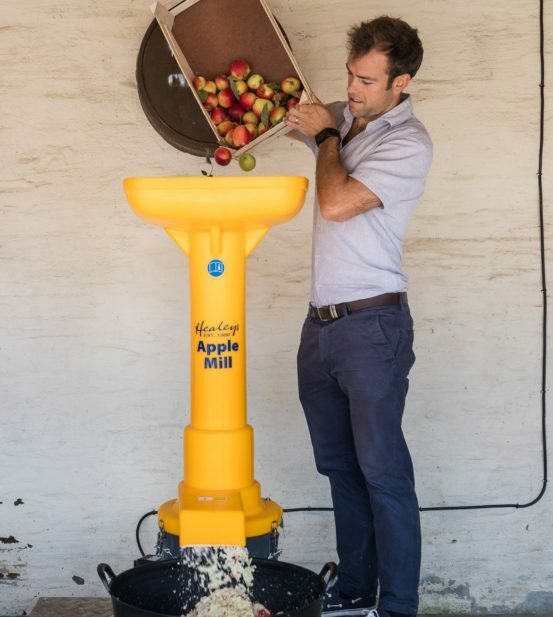 C100 member Healeys are giving locals the chance to turn their surplus apples into juice or cyder. The mill and press are free to use (over 16s) with a donation to CCF. The brand-new juice and cyder-making experience has pressed into action at Healeys Cornish Cyder Farm for visitors and locals to use free of charge this Autumn (charges may apply containers and kits.) Full details available on the Healeys website. After all the action, pressers can head upstairs to the Mowhay Tea Rooms for a famous Healeys homemade afternoon or cream tea or work up an appetite for lunch in The Old Bottlery Restaurant accompanied by a Healeys pint made on the farm. The mill and press will be free to use with a donation to Healeys’ chosen charity, Cornwall Community Foundation who’s aim is to bring together people who want to help Cornish communities with projects that make a real difference. The ‘press your own’ activity will launch at Healeys Cornish Cyder Farm on Friday 31st August for apple growers and then be a permanent fixture in the stable courtyard at the farm during harvest season as one of the top things to do in Cornwall. With free parking and free entry, the new free-to use press facilities are a fantastic addition to a full day out at the farm. Tour and tractor ride charges apply.